I've grown relatively picky about the canned chili I'll use when we make chili dogs for dinner. This is a list of the three brands that top my list. My wife and I both work and, between that and various other activities (such as our daughters’ ice skating lessons), things can be somewhat hectic in our house. As a result of this, we do sometimes have to take short cuts when it comes to dinner. One of the ways we end up doing this is by, on occasion at least, making chili dogs. 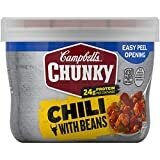 These are quick, affordable and are something everyone in the family will eat (though my daughters usually skip the chili part of it). However, since I do have to rely on canned chili, I have become a little picky about which chili I prefer on my hot dogs and have even began to rank them according to my preference/availability. And, because of this, I do have three that top my list. This is a brand that sometimes frustrates me because not every store carries it and even the ones that do don’t always have it in stock. However, when it is available, I make sure it is the brand I end up purchasing (even if it means spending a little more). The thing I really like about this brand is it is chili I could eat just as chili. This is important because there are times when I’m not in the mood for a second chili dog and just want to scoop some of the chili into a bowl instead. And, of the three brands on this list, this is the only one I really can say that about. However, I will confess, the fact is is a little on the soupy side does make the chili dogs a little sloppier. As far as spices go, this one is easily one of my favorites because it has a good blend of seasonings that make it bold without crossing over the line and being spicy. I don’t mind spicy. But, I don’t want spicy chili on my chili dog. This brand makes my list primarily because of availability. Regardless of which store I go to, chances are I’m going to be able to find this brand on the shelf. And, that reliability does score some points with me because there are times when I would just prefer to run up the street to Walgreen’s rather than drive a few blocks further to one of our grocery stores. 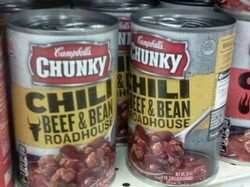 As far as overall quality goes, I still like the Campbell’s Chunky brand better. But, this brand does have its merits too. The flavor is decent and I would score it above most other canned chili brands because of a good blend of seasonings. One other thing I found I like about this brand is the variety of flavors I can choose from, something that has allowed me to go without beans one night or experiment with turkey (which I actually thought was pretty decent). I also have the choice to have a mild chili or spicy chili. Again, I wouldn’t pick the latter for hot dogs. But, it’s still nice to have that option. Hormel Chunky With Beans Chili. Since 1891. U.S. Inspected and passed by department of agriculture. As far as flavor goes, I would score this brand right up there with the Hormel brand. There’s a good blend of seasonings in the chili, it’s chunky rather than soupy (a big plus when it comes to chili dogs) and definitely one of my favorites. In fact, if I were to base this solely on taste, I would probably rank this a little higher than the Hormel brand (especially since it is also usually a little less expensive). What bumps it down one spot below Hormel is, again, the availability. While Hormel is available almost everywhere, I can only find this brand at select stores. Plus, it (along with most other brands) doesn’t have as many varieties as Hormel does. For generations, Wolf's Brand unique blend of seasonings and good hearty beef have delivered authentic chili taste. Having a lot of shade doesn't have to prevent you from growing a vegetable garden.